See how hard work and your support can change New Yorkers’ lives. “I am just thankful that I can leave something behind for my son, so he can have a head start. A safe and comfortable place where he can lay his head and call home." As a Community Associate for the City of New York, Lizar A. oversees five shelters, helping others find permanent housing. 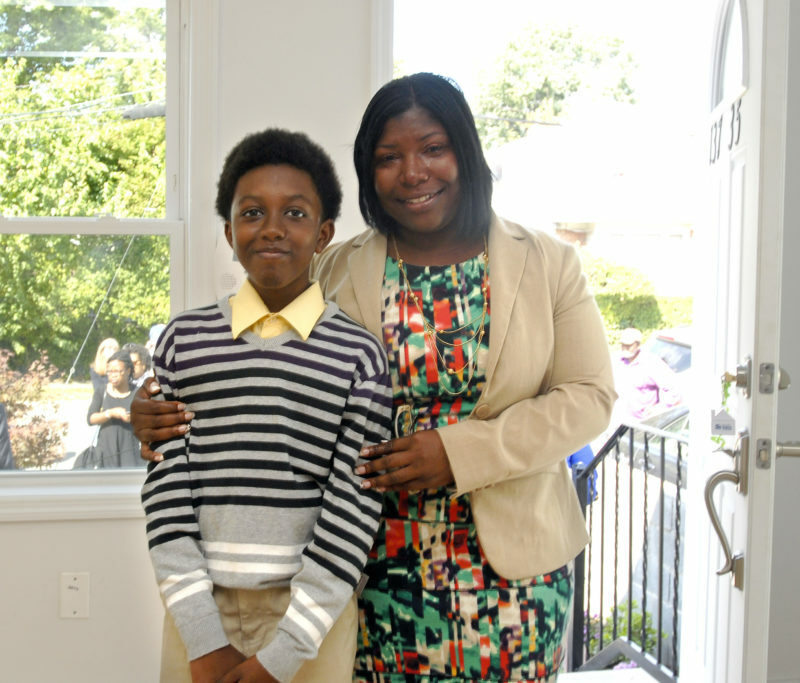 But providing a safe, affordable home for herself and her son Ajahnai, proved difficult. 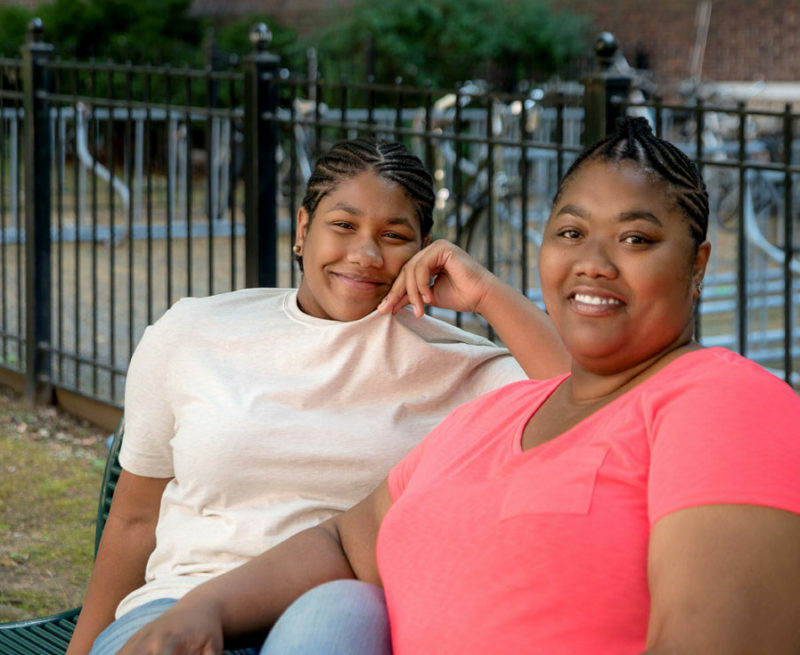 Lizar and Ajahnai live in a comfortable apartment, but the neighborhood isn’t safe – Lizar rarely feels safe outside, the parks nearby are dirty and dangerous and her neighbors play loud music all night long. It’s a situation they want to improve. Lizar attended a few other first time homebuyers programs, but after being referred to Habitat NYC by a friend of a friend, she applied and was accepted into our Home Purchase Program. She kept on top of her finances and attended seminars, and now, she is well on her way to becoming a Habitat Homeowner. Something else in the family’s future? A potential dog! "I'm getting so much out of this program, and it's so meaningful to me to do work in the community as part of my sweat equity. Each hour we contribute helps make a difference." What excites them most about owning a home – other than some privacy! – is setting an example for their daughter to achieve her own dreams. “Owning a home will teach my kids to do the same when they grow up,” Jose wrote. Erneita D. has lived in New York City for more than 20 years, but she and her 11 year old daughter try to return to her native Jamaica once a year. The two share a rent-controlled one bedroom apartment in Flatbush, Brooklyn. The building is in good condition, with an attentive super, but it’s just not theirs. 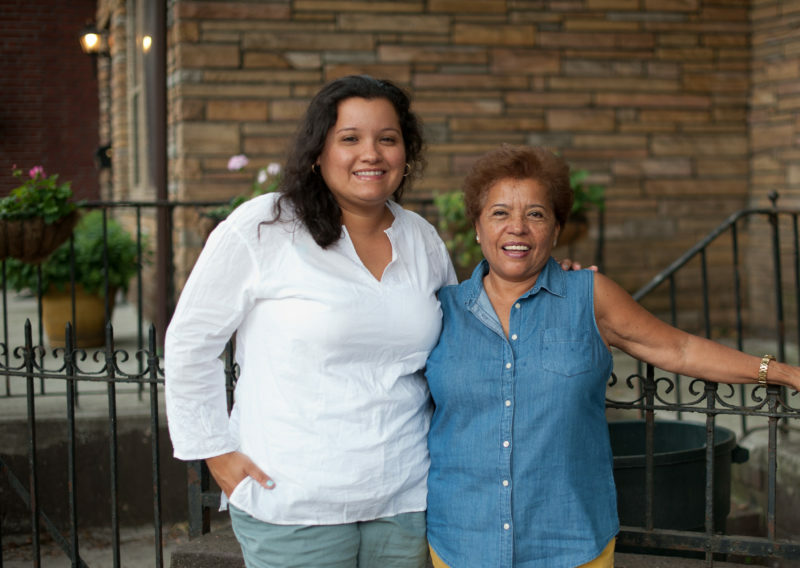 Erneita has been looking to buy a home, visiting open houses in her neighborhood to survey the market, but she never found anything in her price range. Although she knew about Habitat NYC for a few years, she decided to apply for its homes in East Brooklyn, which is near her existing neighborhood. She was accepted to the program, and will soon move into the Dean Street Condominium in Ocean-Hill/Brownsville. View Mike and Gladys M.’s story. 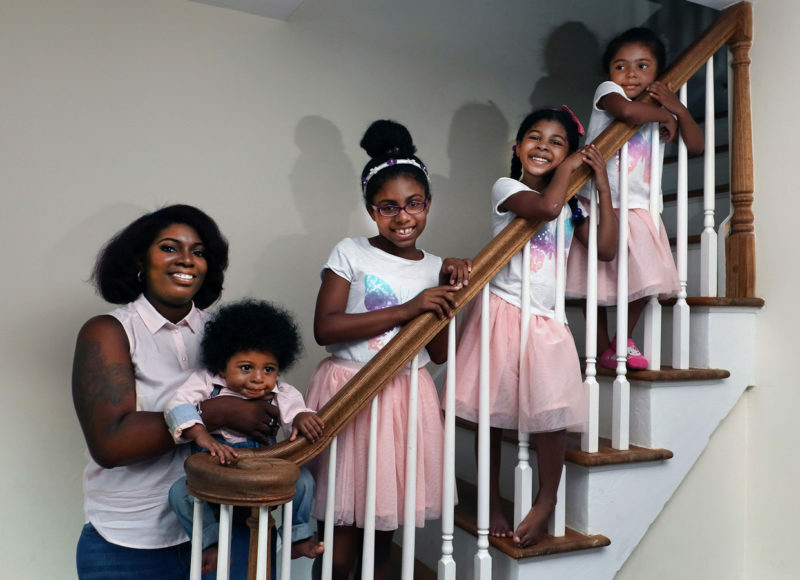 Eleven years ago, Mike and Gladys M. were raising their three daughters, ages ten, seven and four, in a cramped one-bedroom apartment. They were always on the lookout for better, more permanent housing, but with the cost of living in New York City outpacing Mike’s wages as a truck driver, it seemed like a pipe dream. All that changed when they discovered Habitat NYC. In March of 2006, this close-knit family completed its “sweat equity”— the hours of labor that Habitat homeowners dedicate to building their own homes and the homes of their neighbors. 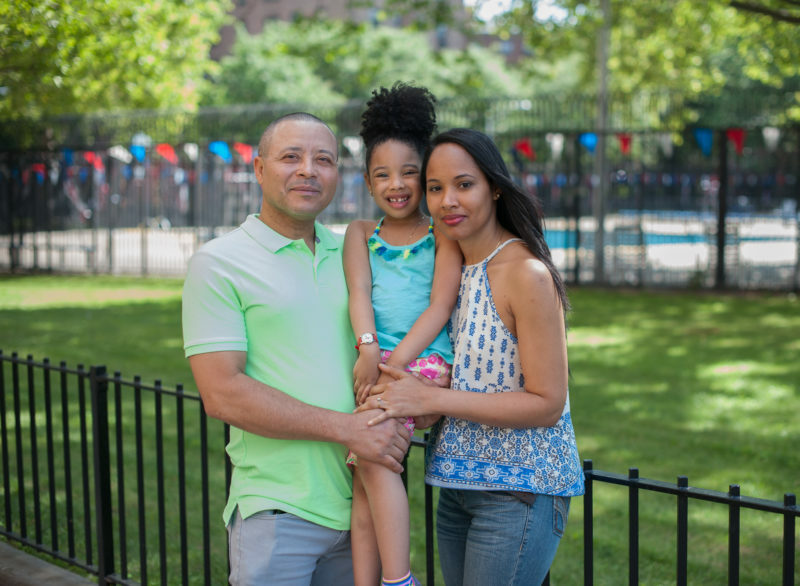 With help from Habitat NYC’s many generous supporters and volunteers, they were able to achieve what had seemed like an impossible dream: owning a home in New York City. For Gladys, the time spent working with her family on the construction of their home was its own reward. “It was a wonderful thing to put my hands on a building that I was going to live in afterwards,” she recalls. 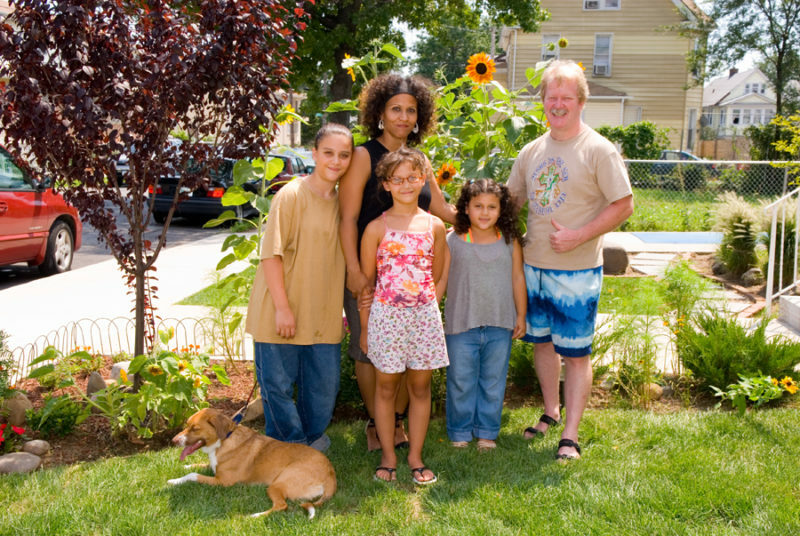 Mike, Gladys and their daughters have lived since then in their own house: a comfortable, energy-efficient three-bedroom Habitat home in Jamaica, Queens. Their daughters, Mikayla, now 21 and a college student, Kristiana, now 18 and a college student, and Analiese, now 15 and in high school, have grown up in a spacious home with a yard and a vegetable garden. In February of this 2016, Billy T. and his wife Anna lived in a cramped one bedroom apartment in Midtown Manhattan with their two children, daughter Maya and son Layne. Billy and Maya slept on a pull out couch in the living room so that Anna and Layne could sleep in the bedroom. Through the Carter Work Project, Habitat NYC renovated a three-bedroom home in Rosedale Queens for the family. More than being three-times bigger than their midtown apartment, the house has a backyard, which is great news for their dog Snoopy, who had been living with Anna’s mother. Billy and Anna are both immigrants – he from Taiwan and she from Russia – and they are finally able to achieve a piece of the American dream: homeownership. Billy, an audio-visual engineer, used his remaining vacation days to put in the sweat equity required for a Habitat Home. “If Habitat didn’t exist, I don’t think I would have been able to buy a place and own my own home. It’s so important to me to have a good home for my kids. I'm doing all this for them,” she said. 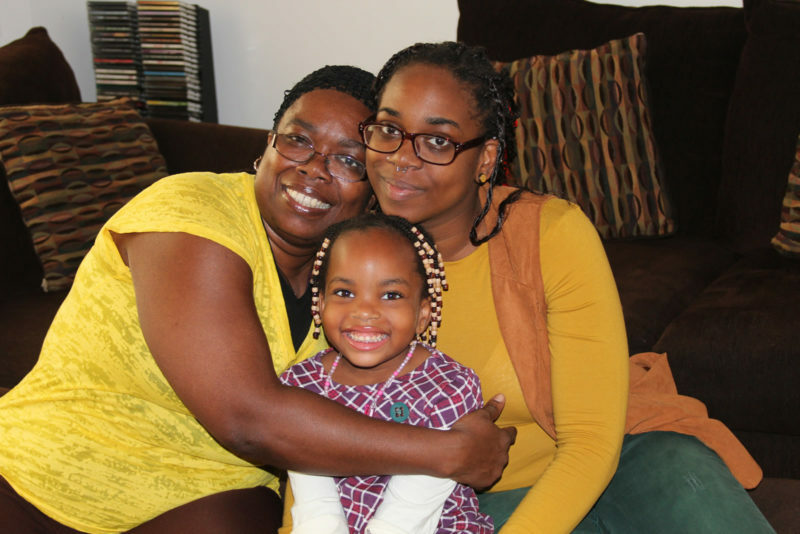 Prior to partnering with Habitat NYC, Yvette P. had been living in a one bedroom apartment with her two daughters, Stacey and Samara. The apartment was cramped, moldy, and the ceiling was constructed with dangerous asbestos. Yvette completed 400 hours of sweat equity, helping to hang drywall, paint and accomplish numerous other projects. She even volunteered after her requirement was completed! Now she, Stacey and Samara live in a mold and asbestos-free three bedroom apartment. Each has their own room for the first time. Yvette especially enjoys tending to the garden in front of their new home. Yvette says her Habitat experience has been life-transforming: “If Habitat didn’t exist, I don’t think I would have been able to buy a place and own my own home. It’s so important to me to have a good home for my kids. I’m doing all this for them,” she said. Voncille C. and her son Ahmai initially lived in East New York to save money, but she didn’t feel safe returning home late and Ahmai couldn’t play outside. After their neighborhood experienced multiple shootings, she knew she had to move and find a safe place to raise her son. Voncille grew up in the St. Albans area of Queens and had always dreamed of living in a home near there. 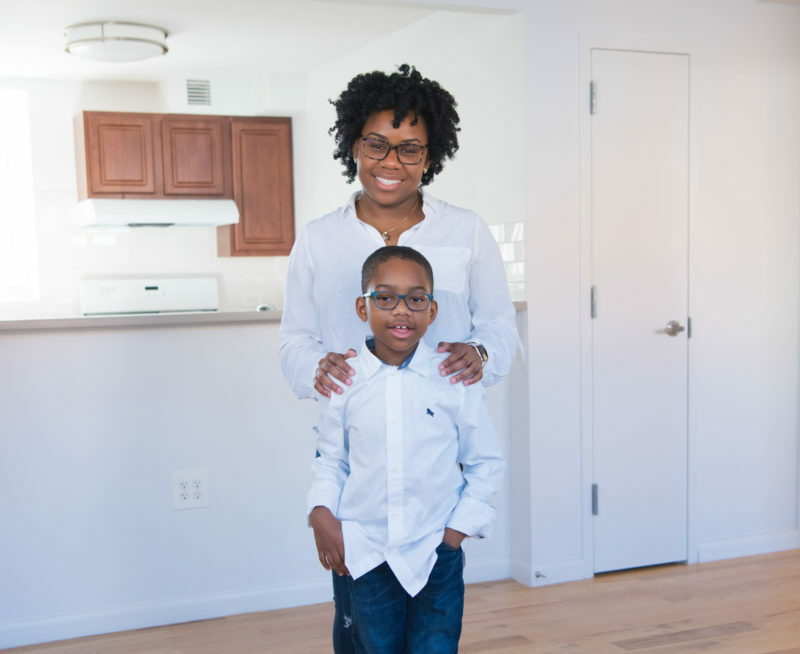 When she learned that Habitat NYC was renovating vacant homes near her childhood neighborhood, she knew it was a perfect fit. Voncille’s Habitat home is just ten minutes away from where she grew up. Voncille recently closed on their Habitat house in Queens, and take great pride in their new status as homeowners. When asked what owning a home means to her, Voncille said simply, “Determination and dedication pays off.” We couldn’t have said it better ourselves! “Lifelong New Yorkers realize early on that their childhood is like no one else’s. All sorts of opportunities are at our fingertips. The streets here sparkle! Lifelong New Yorkers also realize how tough it can be to raise a family here but know it is absolutely worth it. I work hard to provide for my daughters. So when they asked me for a backyard, I worked even harder to give it to them. However the more I researched it, I began to feel defeated. How can I save aggressively enough to afford a home for my girls while paying for our day to day? I teach my children that when something seems impossible, that it is in fact possible! Help us continue to transform lives and communities across New York City!